ALCOR is an exclusive Dealer & Distributor of Aquatherm/Solar Industries solar pool products for Contra Costa and Alameda counties, Benicia and Vallejo. Aquatherm Corporation produces not only the best looking solar collectors but also the best engineered. Aquatherm/Solar Industries is the largest U.S. manufacturer of solar swimming pool heaters, and well known for the Ecosun Solar Pool Heating Collector. They have been featured in numerous publications and appeared on CNBC as a classic American success story. Their entire manufacturing process takes place at their 50,000-square foot technology center in Lakewood, NJ - the most modern facility of its kind in the world. Why should I buy a Solar Industries solar pool heating system? The Solar Industries collector has been in continuous production and service since 1976. It’s backed by the strongest warranty in the industry. It has been engineered as a completely integrated system to exacting specifications and quality control... to provide you with extended trouble-free performance. Superior components, including stainless steel hardware. The Solar Industries Solar Pool Heating System has been tested and its performance certified by accredited independent laboratories and approval agencies. 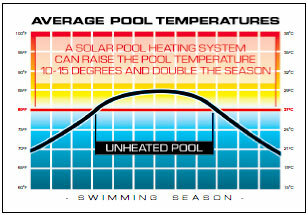 Is solar pool heating dependable? Solar Industries Systems have been on the job worldwide since 1976 heating pools, hot tubs, spas, municipal and commercial pools, hotels and resort clubs making swimming seasons longer, more comfortable and environmentally friendly. As long as the sun keeps shining, you can depend on solar. Whether you currently heat your pool or are just thinking about it, a Solar Industries System will pay for itself in as little as two years. After that, you’ll be collecting dividends year after year while heating your pool with the sun’s free energy. Using your existing pool pump, water is circulated through the many small passages of the solar collector, where it is warmed by the sun. This warm water then flows directly back to your pool through the regular pool plumbing. Solar Industries Solar Pool Systems are designed to work with your existing filtration equipment as well as the latest in pool automation technology. A Solar Industries System can also work alongside your existing conventional heater. It uses solar as the primary source of heat and a gas heater or heat pump as a backup heater. With a hybrid pool heating system, you’ll have the best of both worlds. How long can I expect my Solar Industries collectors to last? Solar Industries is the only solar pool heating collector that has survived a gruelling 23 year life expectancy test performed in the Arizona desert. In addition, Solar Industries offers the strongest warranties in the industry, which are backed up by actual field experience since 1976.